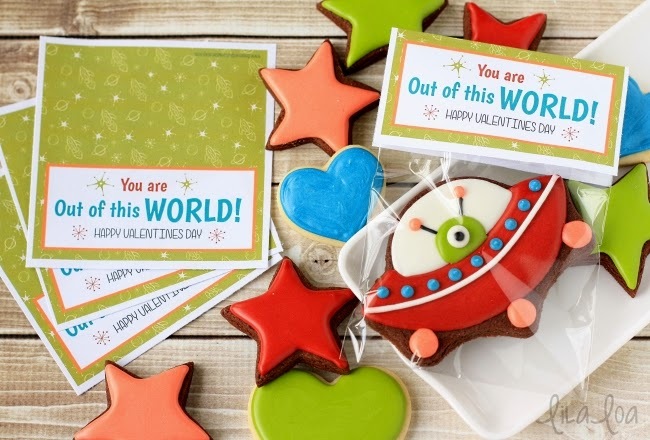 You are OUT OF THIS WORLD Valentine!!! Remember when you were in a Cookie Coma right after Christmas because you baked your entire life away and then SURPRISE!!! It was Christmas Eve and you still had to wrap a jillion presents and figure out *something* to give your neighbors and for the love find actual time to finally SLEEP?! Can you believe that was a month ago? Well...clear back then, all those ages of cookie years ago... I was thinking about you. And how you would really love some fun new Valentine's Day ideas. And then I talked to Tracy at Whisked Away Cutters and Krista at Drawn With Character, and as it turns out, they just love you all to pieces like I do and wanted to join the party. So this week I have THREE new cutter/designs from Tracy at Whisked Away Cutters to show you AND Krista has designed the most adorable bag toppers to match the first two that you can find in her Etsy shop! Best Valentine Cookie Week ever!!!! Also... I made a coconut cake today. From an actual coconut. And anyone who tells you that they know of an *easy* way to open a coconut might be tricking you. Because I watched all those videos, and it wasn't true. I very nearly lost a limb. Which I wasn't as worried about as I should have been because I was pretty sure that as soon as I drank that magical coconut water I would be all healthy and smart and probably be able to solve the world's hunger problem while curing caner. As it turns out though...coconut water kind of tastes like badness. Do you know they sell that? Like, at the store. And it costs real money. And then people buy it and drink it. I don't...I can't...does not compute. Is this real? Is the world tricking me? Maybe something is wrong with my taste buds. Because I've seen all those movie where the half dressed man is all sweaty and tired and breaks open a coconut (with the greatest of ease, I might add) and instantly has his thirst quenched with whatever liquid is supposedly hiding inside said coconut. And at no point in this movie does he end up dry heaving into the bushes or pretending to so no one will try to convince him that "it's really not that bad" or to "grow up and stop making those faces." Because who wants to be all grown up and responsibly eating healthy foods that taste like they might have actually spoiled? Not this girl. This girl is making fun Valentine's Day cookies. Are you with me? 1. 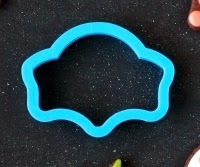 With medium consistency white icing, follow the dome shape of the spaceship and give it a curved bottom. Let it dry for a few hours if you are going to use a saturated color like red right next to it. 2. Fill in the bottom of the ship with red icing. 3. Pipe a little alien head on top of the white icing. 4. 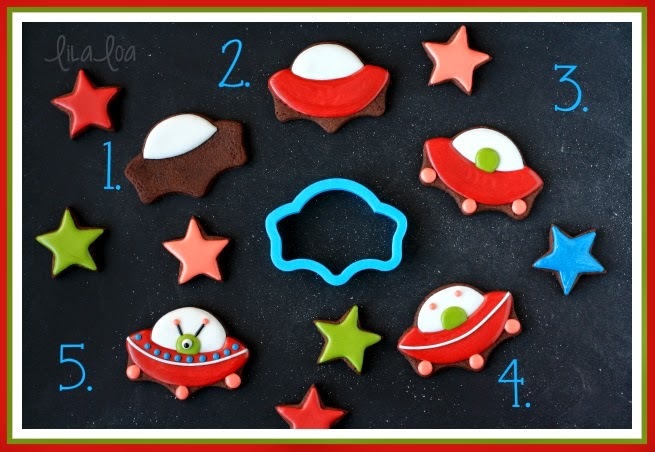 Use thick white icing to add a mid line to the space ship and medium consistency peach icing to pipe circles for the wheels and alien antennae. 5. 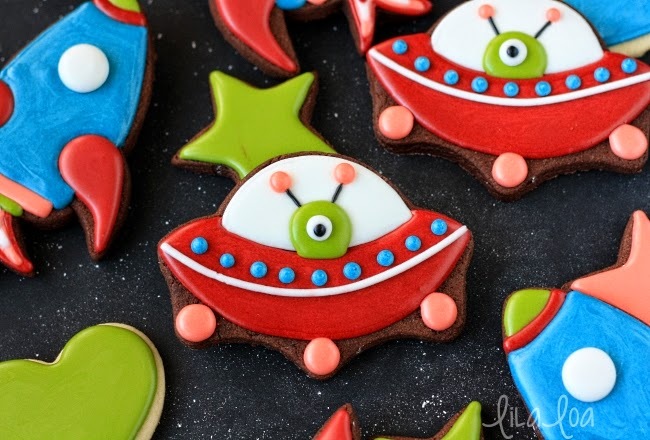 Add a dot of white icing on the alien and immediately add another dot of black on top for the eye. Finish the antennae with thick black icing and add blue dots along the mid line of the ship. So easy and fun, right? And they are quick enough that you can make them for all the neighborhood kids who perch on the stool in your kitchen "just watching" while you decorate! What? Just me again? 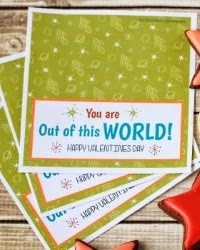 Well...with these perfect toppers you can give them to whoever you want! 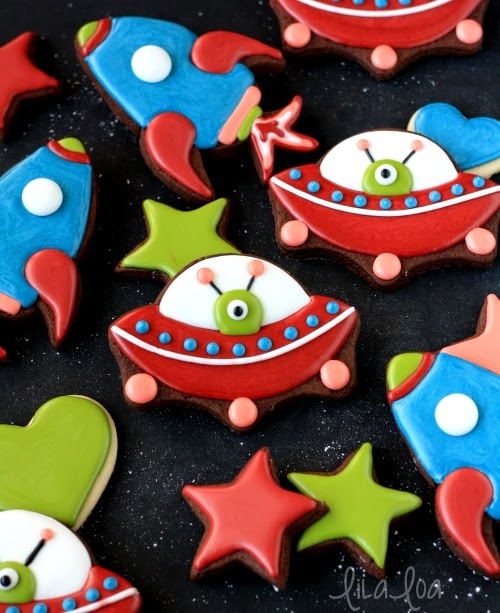 Get the cutest spaceship cutter in the world from Whisked Away Cutters HERE. And get the perfect matching bag toppers in the world from Drawn With Character HERE. 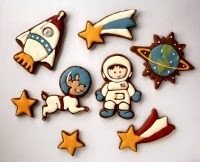 Find out how to make my most favorite space cookies of all time from Klickitat Street HERE.